Holy smokes! If you haven’t read Lori Gottlieb’s article in The Atlantic, “How To Land Your Kid In Therapy,” do yourself a favor. She’s put together a remarkable overview of the pitfalls of modern parenting, focusing particularly on the relationship between parental over-involvement and the rates of anxiety/depression in their offspring. A practicing clinical psychologist herself, Gottlieb makes a strong case for the culture of self-esteem having produced a supremely narcissistic generation that has serious trouble dealing with disappointment. It’s almost The Incredibles-argument verbatim: when everyone is special, no one is special – instead, we all become a bunch of ‘handicapped royalty’. She also exposes the equally problematic but less discussed parental narcissism that’s feeding the whole process. Obviously there is a spiritual dimension here – the God-shaped hole and all that, the idol of children/family – but what naturally interested me most were the various legalities involved: the poisonous “shoulds” and “if-then’s” lurking in pretty much every crevice of personal unhappiness, e.g. “I’m happy but I should be even happier”, “If I only make the right decisions with my kids, then they will succeed (and so will I!)”. Pretty soon you’re living in a prison constructed by misinformed notions of control and responsibility. Nevermind that this kind of agency is an illusion, the dynamics here are uncanny: the more we focus on our children’s self-esteem, the more apt they are to suffer from depression. The more intense the parenting going on in a household, the less actual parenting is probably happening, that the kids are being made responsible for their parents’ feelings of safety and peace instead of vice versa. And so on and so on. A religious person might say that our attempts to play God backfire, by definition, that there’s an inverse relationship between hubris and happiness, etc etc. Could one go so far as to say that The Law (the “if-then’s” and “shoulds”) not only exacerbates but relies on our self-absorption? That it essentially “runs on” sin? And a (theoretically) non-self-interested person, someone not convinced to some degree of their own divinity, would have no way in, or at least minimal attraction to it? I’m not sure… Maybe. There’s also a lesson here about the dangers of affirmation devoid of any rejection or reality. It would appear that it screws people up! Perhaps the Gospel only makes sense – and has an impact – in light of the Law. I wish it weren’t so, but who am I to argue with all these highfalutin’ doctors? Could affirmation simply be the flipside of condemnation? The opposite end of the same ‘goodness’ scale or judgment continuum or what have you? Seems to me that it’s all Law, any way you slice it, and functions within the same approval matrix, ultimately producing similar results: fearful, insecure men and women. Here I was, seeing the flesh-and-blood results of the kind of parenting that my peers and I were trying to practice with our own kids, precisely so that they wouldn’t end up on a therapist’s couch one day. We were running ourselves ragged in a herculean effort to do right by our kids—yet what seemed like grown-up versions of them were sitting in our offices, saying they felt empty, confused, and anxious. 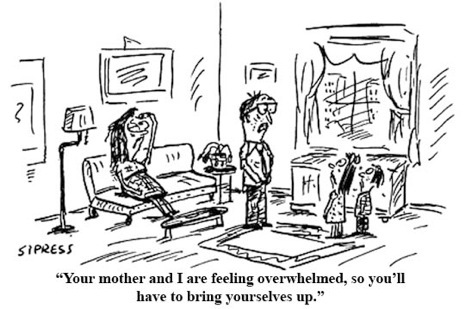 Back in graduate school, the clinical focus had always been on how the lack of parental attunement affects the child. It never occurred to any of us to ask, what if the parents are too attuned? What happens to those kids? Nowadays, it’s not enough to be happy—if you can be even happier. The American Dream and the pursuit of happiness have morphed from a quest for general contentment to the idea that you must be happy at all times and in every way. “I am happy,” writes Gretchen Rubin in The Happiness Project, a book that topped the New York Times best-seller list and that has spawned something of a national movement in happiness-seeking, “but I’m not as happy as I should be. How happy should she be? Paul Bohn, a psychiatrist at UCLA who came to speak at my clinic, says the answer may be yes. Based on what he sees in his practice, Bohn believes many parents will do anything to avoid having their kids experience even mild discomfort, anxiety, or disappointment—“anything less than pleasant,” as he puts it—with the result that when, as adults, they experience the normal frustrations of life, they think something must be terribly wrong. 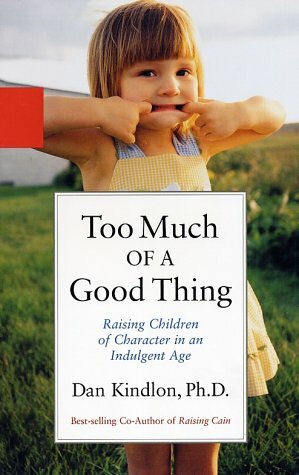 [Clinical psychologist and author, Dr. Wendy] Mogel and [Harvard child psychologist] Dan Kindlon agree that whatever form it takes—whether the fixation is happiness or success—parental overinvestment is contributing to a burgeoning generational narcissism that’s hurting our kids. When ego-boosting parents exclaim “Great job!” not just the first time a young child puts on his shoes but every single morning he does this, the child learns to feel that everything he does is special. Likewise, if the kid participates in activities where he gets stickers for “good tries,” he never gets negative feedback on his performance. (All failures are reframed as “good tries.”) According to [Dr. Jean] Twenge, indicators of self-esteem have risen consistently since the 1980s among middle-school, high-school, and college students. But, she says, what starts off as healthy self-esteem can quickly morph into an inflated view of oneself—a self-absorption and sense of entitlement that looks a lot like narcissism. In fact, rates of narcissism among college students have increased right along with self-esteem. Barry Schwartz, at Swarthmore, believes that well-meaning parents give their kids so much choice on a daily basis that the children become not just entitled, but paralyzed. “The ideology of our time is that choice is good and more choice is better,” he said. “But we’ve found that’s not true.” Like most of my peers, I’d always thought that providing choices to young children gave them a valuable sense of agency, and allowed them to feel more in control. 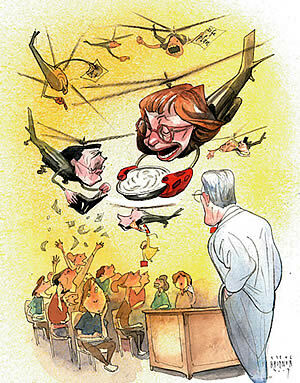 But Barry Schwartz’s research shows that too much choice makes people more likely to feel depressed and out of control. And yet, underlying all this parental angst is the hopeful belief that if we just make the right choices, that if we just do things a certain way, our kids will turn out to be not just happy adults, but adults that make us happy. This is a misguided notion, because while nurture certainly matters, it doesn’t completely trump nature, and different kinds of nurture work for different kinds of kids (which explains why siblings can have very different experiences of their childhoods under the same roof). We can expose our kids to art, but we can’t teach them creativity. We can try to protect them from nasty classmates and bad grades and all kinds of rejection and their own limitations, but eventually they will bump up against these things anyway. In fact, by trying so hard to provide the perfectly happy childhood, we’re just making it harder for our kids to actually grow up. Maybe we parents are the ones who have some growing up to do—and some letting go. Wow. I especially like the idea of affirmation being the flipside of condemnation, that it just as easily produces the fight-or-flight in us. How quickly affirmation puts us in a shadow of doubts. This reminds me of “The Inverse Power of Praise”, a fantastic article a few years back from the folks who later wrote Nurture Shock. It changed the way I taught kids at the time, and has effected my approach to parenting once my kids came along. Um yes…I’m overwhelmed by how right on this is. I see this. It’s so true. Going to ponder all this a bit…and try to honestly view myself admist the applications. Drats! Too late for my kids. Here’s hoping for that redemption thingy. God called you to ministry before you were born. I believe the Lord has a special end-times role for you in the Church before Jesus’ return. You have X spiritual gift. You should do X because that’s where you’re real gifting is and I don’t want you to miss your calling like so-and-so did. Interesting and thought-provoking stuff. I have two young boys and am definitely guilty of trying to create the “perfectly happy childhood” for my kids that Gottlieb speaks against. I definitely need to be more aware of the ways in which I want to shield my kids from failure or disappointment. I’ve also been revisiting a great book by Marva Dawn entitled “Is It a Lost Cause? Having the Heart of God For the Church’s Children” where Dawn speaks extensively about shielding our kids from the damaging effects of our culture and society – particularly through the media. While this is different from the topic of children’s self-esteem, I think that many parents are “under-invested” in protecting their children. These days, it seems like some (Christian) parents might be labeled “over-invested” or “over-protective” just because they want to keep the garbage of our culture away from their kids for as long as possible. In my own situation, I no doubt need to examine the ways in which I might be setting my kids up for a horrible reality check as adults, but I also think that due to the state of contemporary society and culture in North America, simply striving to protect your kids from a host of negative influences requires so much thought, time, and energy that some might label you as an “over-invested”, “over-protective” parent. Gottleib’s latest piece in the Atlantic provides a sensible wake-up call for uber-parents who do too much for their children, all in the interests of making them “happy” and protecting them from failure. In our new book, “Undecided: How to Ditch the Endless Quest for Perfect and Find the Career — and Life — That’s Right for you” we focus on the results of that kind of over-parenting on today’s women: analysis paralysis, second-guessing and grass-is greener syndrome. It’s a generational malise, this pervasive sense of dissatisfaction and overwhelm, the feeling that no matter what they choose in terms of their life path, it is never enough.